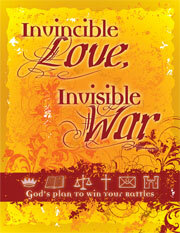 Watch an introduction to the Bible series, Invincible Love, Invisible War. 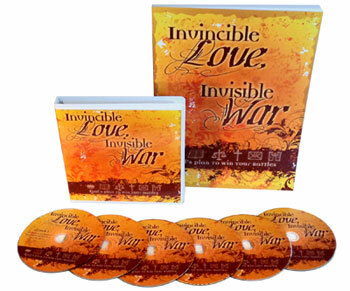 This dynamic seven-week study unravels the threads of the invisible war we all face and the victory available through God’s invincible love. It answers questions such as: If God loves me, why is life such a battle? Is there ever an end to the war? Even though the Bible was written over a period of about 1,500 years by over forty authors, there is a unity that can only be explained as supernatural. There is a consistent message that God loves us and that although life is a series of battles, He desires for us to live in victory. The corresponding workbook reveals God’s Word in fresh ways through five days of insightful home study per week. It explains that Jesus is your victorious warrior in battles with sin, Satan, and the world system. The study also provides tools to enable you to stand firm in the face of temptation, loss, guilt, fear, and confusion.